Wearing her own design, Merope, in garter stitch. Oh my goodness. Romi. She is one of those people. The kind of person that inspires awe. She is constantly designing the most beautiful projects, everything from the most delicate of shawls to hearty, worsted weight sweaters...with a touch of lace. 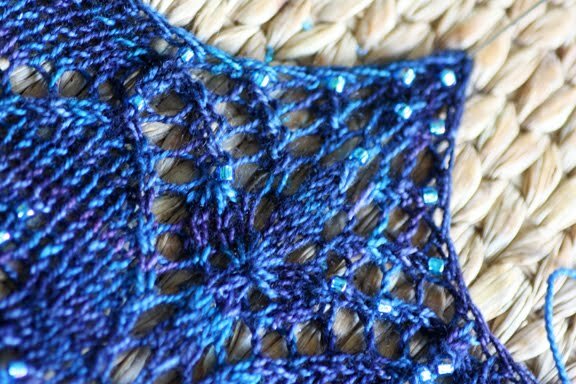 She even knits with metal as you may know from her book Elements of Style. 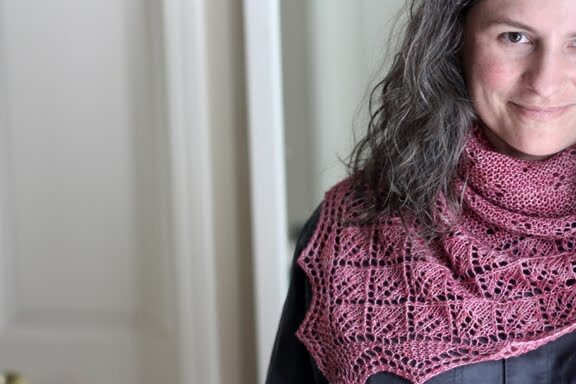 One of Romi's most current projects is a challenge posed to herself, to design and self-publish 7 Small Shawls between May and the end of 2010. To see, her progress visit her blog. Pretty amazing! Romi lives in one of my hands down favorite places in the world, Sonoma County, California. I can see the reflection of Sonoma County and its wild, Northern California nature in her pieces. Ice Queen reminds me of the froth on a Pacific wave's crest. Muir alludes to Romi's love for the California Bay Tree. 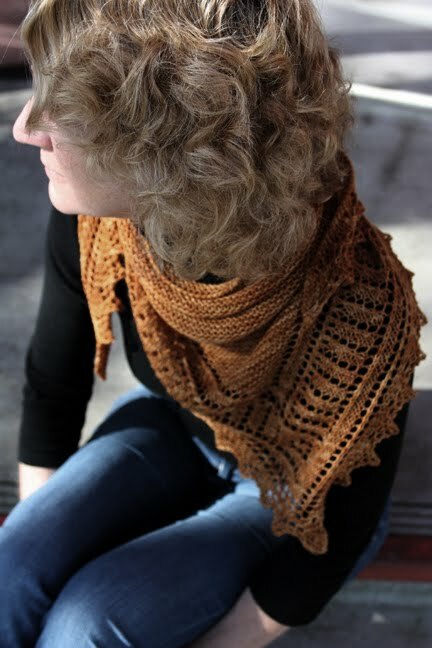 And who wouldn't want to wear Leyfi to the coast on a breezy Autumn day? Romi's pieces are wearable and beautiful. I guess it was about the time when I realized that I have a compulsive urge to change any and every pattern I knit! That's a really difficult one! There are several, actually. Of my shawls: I love to look at Fiori di Sole and I love to wear my garter stitch version of Trieste. Of my sweaters: Leyfi without a doubt. I almost couldn't part with it! I can imagine wearing it every day during winter. It's lacy, green, soft, warm and flattering. For me, I think that question is kind of like asking "what drives you to sleep or eat?" ;) I'm always thinking about designs. Before I designed knitwear, it was graphic design and illustration I thought about. When I let my mind wander, it just comes up with designs. Taking the concept and turning it into a garment: the stitch engineering stage, if you will. You have all the time in the world and have every skill set what would you design?I don't know that I would do anything different. Since I design things that I think people will like knitting, I really try to stay away from esoteric or super fiddly and crazy difficult. I get my enjoyment out of seeing others enjoy the knitting and wearing of my designs, and I don't think a super long and difficult knit would be very enjoyable to most people. I've always loved yarn! I have worked with woven fabric and clay and many other media, but I love the feel of yarn and the way knitted fabric behaves. I also absolutely love the knitting community. I think that probably has a lot to do with it! Wow. That's a really difficult one. There are so many time periods I would love to see and so many people with whom I would love to talk! I guess, though, if I had to choose one, it would be the conversations and sessions that led to the US Constitution (Constitutional Convention in Philadelphia). What a group of amazingly brilliant minds together in one place! Extraordinary. When I’m designing I can’t live without: Music. My favorite tool to assist in designing is: Exercise! It frees my mind. To continue a life that I enjoy immensely. Everything I see has an influence. It all sort of swirls around in my mind. This is an interesting question, because it's always difficult to view yourself or your designs as others do. I have never really noticed that I have a particular "look," but people tell me that I do. I don't really see it, myself, so I have stopped trying! I can tell you what I am thinking while designing though. I try to design aesthetically pleasing pieces that I think will be flattering on many different people. I always ask myself if I would feel comfortable wearing it myself, and whether it would look good. Where would I wear it? Could I wear it to a business meeting? Out to dinner? For every day? It's fairly simple to design a piece that looks good on a model in a styled photograph, but for it to look good on real bodies in real life? That takes more planning. If you could be anywhere in the world knitting, you would be in: The Galapagos - but I don't think I'd be knitting! Yes! 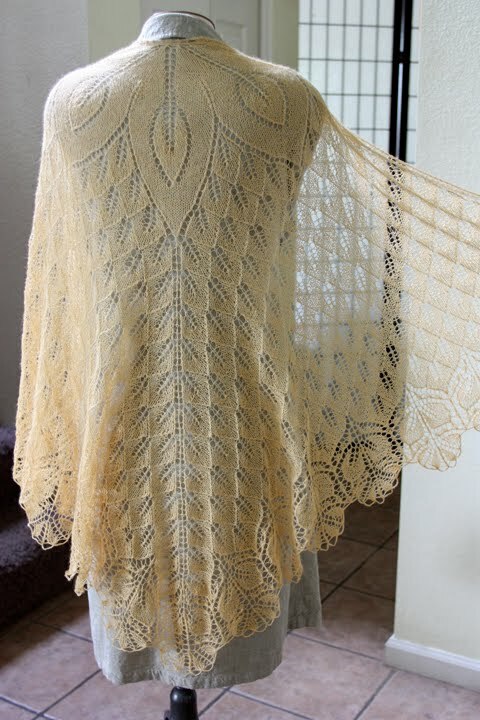 In fact, I designed and knit Bitterroot from knitty.com in Verb's silk/camel that I spun into lace weight. It was a very cool process and the fiber was incredible! I love everything about your incredible colors, and I think you're terrific! It was a total no-brainer that I'd want to be involved with your first (yarn) club! It sounded luxurious and wonderful. I also wanted to use something a little heavier than a lace weight. Not quite as of yet! I'm waiting for the muse to visit. We cannot wait for the muse to visit and to see what Romi will create for the Pro-Verbial! Sign-ups for the Pro-Verbial 2010-11 are almost closed. We have only a couple spots left. if you would like to sign-up or learn more about the Pro-Verbial, please click here. Thanks to everyone who is reading this post! And thank you Romi for your great interview! You are literally killing me with suspense. Romi is so awesome and I know I'm gonna be bowled over by her incredible designs.